Why should forgiveness require the shedding of blood? That is the question implicit in the fundamental Christian belief: Christ died for our sins. Yet it has never been satisfactorily answered. To call the crucifixion of Christ a substitute punishment, a sacrificial death, or a ransom, is merely to raise additional questions. Why would a good and gracious God require an innocent person to die in place of the guilty? Why would he demand a sacrifice? Why a lethal ransom payment? Forgiveness is an act of mercy, but to compel one who is blameless to undergo intense suffering and a violent and shameful death would seem to be an act of cruelty. This apparent paradox was accepted by the New Testament writers, and it has been accepted by Christians, including the best theologians and scholars, ever since. Nevertheless, if Christ died on the cross for the forgiveness of our sins, there must have been something in the mechanics of the crucifixion that eradicated sins; something that we are capable of understanding, and that makes sense in reason and logic, but which has not yet been discovered. Many of the mysteries of God's creation have turned out to be perfectly reasonable once they have been found out. Just as there exist electromagnetic waves that carry television pictures around the globe, bouncing off satellites in a matter of micro-seconds, so there surely must exist a spiritual realm that cannot be observed with the senses, and which we have not yet had the insight to uncover in a manner susceptible to a widespread consensus. Discovery of the means to tap into that spiritual realm might very well result in our understanding of the death of Christ that causes our sins to be forgiven. Conversely, it may be that achievement of insight into the mechanics of the crucifixion is what will enable us somehow to penetrate the invisible domain of the spirit. 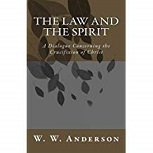 The following discussion, in the form of a dialogue between two conscientious Christians, is an attempt to solve the mystery, to provide a clear, logical explanation for the crucifixion as the means for the reconciliation of sinners. Since the realm of the Spirit is beyond the senses and scientific exploration, theories about it are not subject to the usual standards of proof which rely on observation and experiment. We can, however, apply the tests of reasonableness and plausibility, and the aim of the discussion has been to keep its conclusions within those bounds. The theory that is developed, then, is one that, it is hoped, makes sense as a matter of logic, that is plausible, and that is solidly grounded in the doctrines of the New Testament. At the same time it ought to afford the reader with the basis for an understanding of the Christian religion from a new perspective providing a deeper insight into the basic tenets of Christianity. These, it will be seen, include the resurrection of Christ as a spiritual resurrection, the Holy Spirit as the spirit of Christ which is love, grace as the gift of the spirit, sin as absence of the spirit which supplants the law, and the kingdom of God as the living realm of the spirit. The Appendix attests that many of the conclusions reached in the dialogue are supported by passages in the writings of reputable theologians and biblical scholars. The impetus for the book is a vision of the Cross as a beacon, high on a hill, far back in time, transmitting the spirit of Christ into the world and down through the centuries where it remains available today for us to receive in faith. Beyond that vision is the image of a union, in death, of Christ's spirit with the spirit of God, attained by an unwavering obedience in the face of extreme suffering, and characterized by intense love of God and humankind. If we can but learn to emulate that intense love of God and humankind, then we may hope to receive the spirit of Christ into our hearts; and that will be our salvation.